Shirley and I usually drive over the mountain passes of the Sierra several times each summer. On Wednesday, we left Reno, Nevada around 10am and took the Rose Mt Road over the high pass and followed it as we descended into the Lake Tahoe basin for a beautiful summer drive around the prettiest lake in the country. 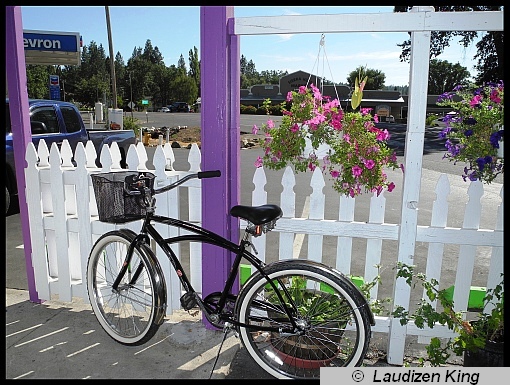 We stayed on rte 89, crossed over Luther Pass, drove through Markleeville, and picked up rte 4 for the drive over Ebbetts Pass as we made our way back home to Modesto. We were tired as the road left the high Sierra behind and descended into the late afternoon summer heat of the foothills so we stopped in Murphys to fuel up and take a break. 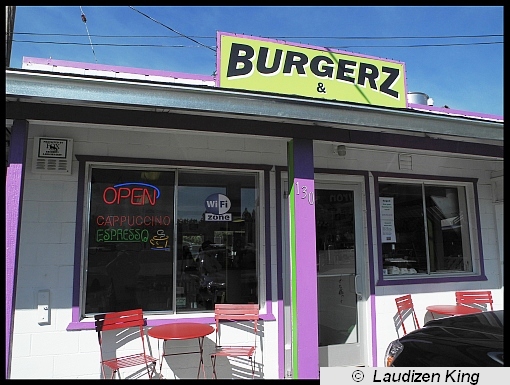 Adjacent to the gas station sat a darling little restaurant called "Burgerz and Coffee". 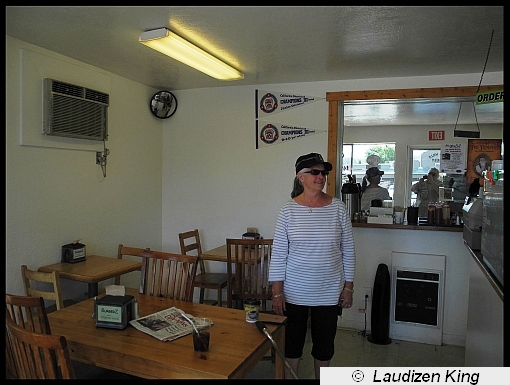 I left Shirley to handle the fueling and went in search of a bathroom and a much needed double cappuccino, and Shirley soon joined me at a table inside the restaurant. What a wonderful place! 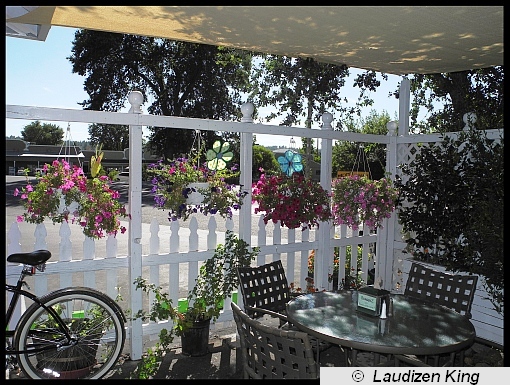 At one end of the building sat a charming covered and fenced-in outdoor seating area featuring hanging baskets of petunias; a shaded oasis in the summer heat. The small indoor room held several tables. Shirley and I relaxed there and spent several minutes talking with Gene the owner and quickly fell in love with the place. Not only do they have great burgers but they also serve natural casing hot dogs for aficionados like myself. 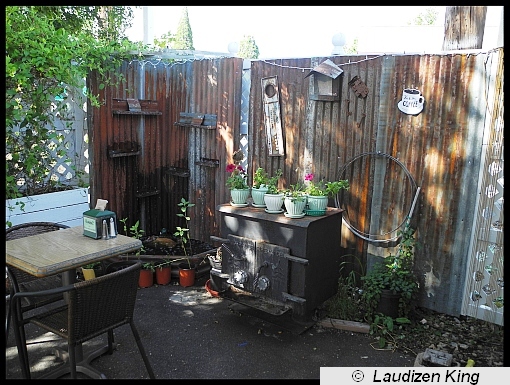 Places like this are the heart and soul of America and it is up to us to support the owners' of these fragile businesses as they compete for a living against the monster-sized hamburger restaurant-chain corporations. 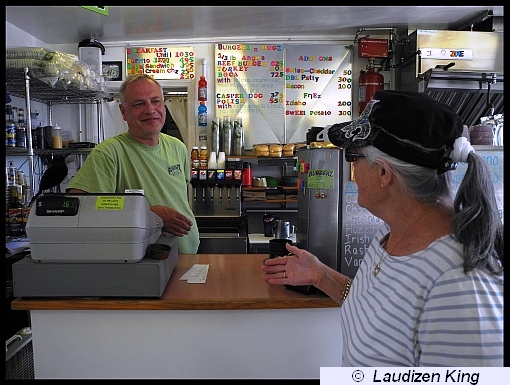 Stop in and visit Gene for a meal and a coffee on rte 4 in Murphys, you'll be glad you did. Shirley chats with Gene the owner. 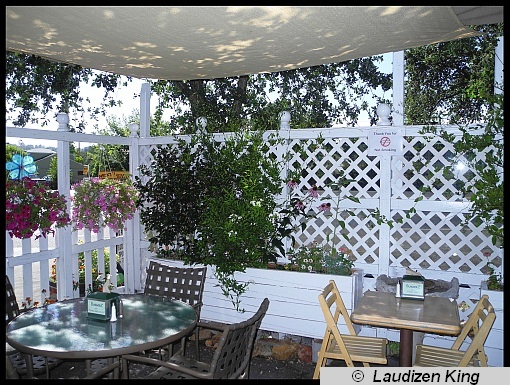 The shaded outdoor seating area. 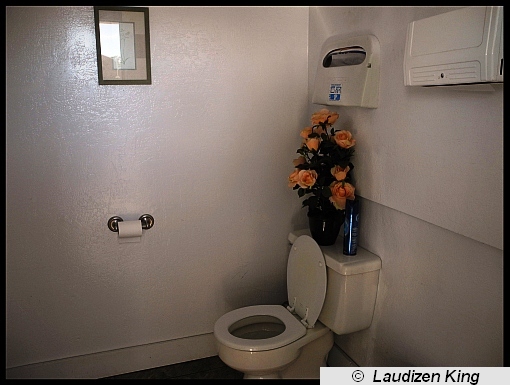 Bathrooms tell a lot about the pride that owners feel for their establishment. The fixtures might be old but the room is spotless and inviting. Shirley gives her seal of approval. 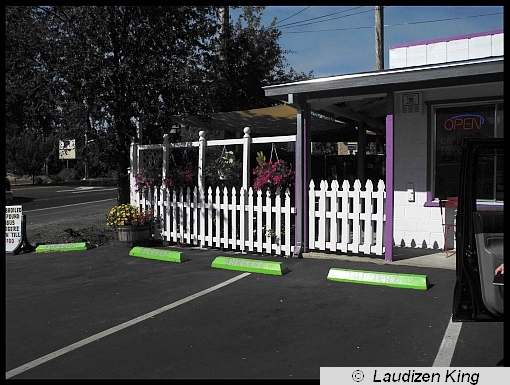 The shaded outdoor seating area from the front.